Pow Wow. Image © 2010 Ruth Lor Malloy. June is National Aboriginal Month in Canada and June 21st is National Aboriginal Day in Toronto. There are lots of opportunities to learn about our First Nations neighbours and to join their celebrations. 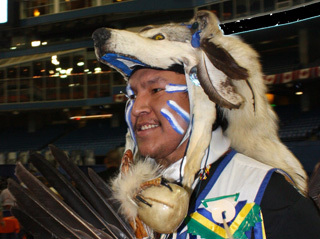 The Native Canadian Centre of Toronto has over three pages of area events listed. For details, please click on: http://www.ncct.on.ca/community-resources.php. Among the highlights will be the highly-recommended program at the Toronto Reference Library on June 8. If it’s anything like the one I’ve seen, this is one of the best interpretative programs you can go to. Representatives of the Native Canadian Centre will explain drumming, regalia and customs. You will have a chance to ask questions. Other Toronto public libraries will have other excellent programs explaining different aspects of the culture, such as artistic expression, songs and dances, medicine, and wampum. Toronto public libraries will also have programs on the Metis and Inuit. 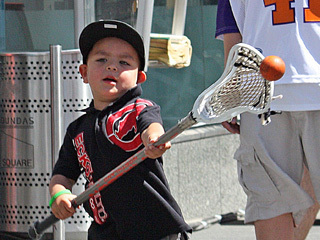 Lacrosse. Image © 2010 Ruth Lor Malloy. Pow Wows are gatherings organized by First Nations people and usually include drumming, crafts, food for sale, and contests for the best dancing and regalia. Lacrosse too. A couple of these events are Pow Wows. Sat. June 11. Aboriginal Day walk/run along Humber River and then attend a teaching circle beside the historical plaque at Etienne Brule Park. This walk follows the old native trails. Scones and water provided free. Metis fiddling and native drumming. See http://bit.ly/jL8oo1 and then come back to our site for more interesting things to do. Wed. June 15. A gathering to honour residential school survivors. March from Queen’s Park to Allen Gardens. Wed. June 15. Full Moon Ceremony for all women. For more information, contact Cultural Department 416-964-9087 X 315 or e-mail: cindilee.ecker-flagg@ncct.on.ca. Fri. June 17. Celebrations with arts and crafts, drummers and dancers. Toronto City Hall. Tue. June 21. 5:30am. Yes, 5:30am. Sunrise Ceremony at City Hall. Tue. June 21. Celebration at Dundas Square. Throat singers, Metis Fiddlers, Arts and Crafts. Sat. June 25. Traditional Pow Wow. Well’s Hill Park (one block south of Bathurst and St. Clair subway station.) Drummers, dancers, crafts, children’s crafts, food sales, silent auction, and traditional feast. Tue. June 28. First Nations School Pow Wow, 935 Dundas St. East. Thurs. June 30. Southeast Scarborough Pow Wow at Eastview Public School, 20 Waldock St. Scarborough. Don’t forget the regular program open to the public at the Native Canadian Centre at 16 Spadina Road on Monday evenings 5:30pm-7:30pm. At that one you can learn hand-drumming. There’s also the regular Thursday Evening Social at 6:30pm to 9:30pm. See our Blogs nos. 10, 14 and 18 for reviews of these events.